Seagull poop on an airplane is evidently the consequence one faces when tying down at a place called "Harbour Air". Despite the seagull poop, our experience at Harbour Air was terrific. The crew was friendly and helpful, including assistance with inflating a soft tire discovered during pre-flight. The Bear was eager to explore our next destination. Mackinac Island is a fanciful place that can only be reached by boat or airplane, where automobiles are forbidden and horses, bicycles, and walking are the sole means of transportation. Of course, it's also rather touristy, packed with visitors aptly described by locals as "fudgies". However, beyond the copious t-shirt and fudge shops exists a pretty cool destination, with beautiful geology and fascinating history. We departed from the towered airfield just in time. For 20 minutes afterward, the controller was juggling a heavy mix of commercial, private, and university flight training traffic. Such chaos on the radio was incongruous with our flight over the serene coastline for a closer look at the Manitou Islands. Ringed with sandy beaches, South Manitou Island could have been a tropical cay were it not for the conspicuous lack of palm trees. We circumnavigated South Manitou Island at 3000 feet, which provided adequate altitude as required by the chart in addition to ensuring that land remained within gliding distance at all times. The island rests approximately five nautical miles from shore. On the west side of the island, we found an impressive perched dune with a similar topography to the Sleeping Bear Dunes. A closer look at this photo reveals one of the 50+ charted shipwrecks around South Manitou Island. We overflew one of the more famous shipwrecks, the Francisco Morazan, run aground in November of 1960. The Morazan was carrying a mixed cargo (including "baled hair"...eww) from Chicago to ports in Europe. The ship was originally launched in 1922 Germany under the name Arcadia and traded hands a few times before being captured by the Allies during World War II. In the process of running aground on a shoal near South Manitou Island, the Morazan literally crushed the wreckage of the Walter L Frost, a wooden steamship run aground just to the south in 1905. As we rounded the southern end of South Manitou Island, North Manitou Island came into sight. We paid our respects to those legendary bear cubs and turned back to the mainland. We flew along the south end of Sutton's Bay before reaching the mighty Grand Traverse Bay. Grand Traverse Bay is really two bays with east and west arms separated by the nearly 15 mile long Old Mission Peninsula. Even as we reached Old Mission Peninsula in the midst of Grand Traverse Bay, the harried controller at Cherry Capital Airport was still trying to sort through traffic while being nagged on the radio by aircraft waiting to depart. The shorelines are what I find to be the most intriguing; hints of a ghost landscape beneath the waves rendered in shades of blue and turquoise. We turned 360° over the tip of Old Mission Peninsula where it terminates into this northward reaching sand bar. Looking to the south, the peninsula extended toward Traverse City, flanked by Grand Traverse Bay. Torch Lake lies just east of Grand Traverse Bay. This turf-only airport, Torchport (59M), was the destination for my first fly-in breakfast in 2004. At the time, I was living in Kalamazoo, Warrior 481 was brand new to me (I was still learning how to land it), and The Bear was three years away from being born. My landing here truly occurred a lifetime ago. The rich blue of Torch Lake was absolutely breathtaking. As we passed south of Lake Charlevoix, a line of clouds was building off-shore. No adverse conditions were forecast, but we all know that forecasts can be demonstrated false in moments. As we crossed Little Traverse Bay, we were intrigued by the patterned sandbars along the northeast shore near Harbor Springs, MI. The Strait of Mackinac is the point at which the upper and lower peninsulas of Michigan are at their closest. The five mile wide strait is spanned by the Mackinac Bridge and also serves as the demarcation between Lake Michigan and Lake Huron. Mackinac Island sits in the waters of Lake Huron. The long white structure of the Grand Hotel was easily recognizable from over fifteen nautical miles southwest of the island. The Grand Hotel, photographed from the Mackinac Island Airport traffic pattern. It is a stately, magnificent structure. Though, honestly, seeing it makes think of Jane Seymour shrieking "Richard!" over and over again in horror (the only bit of that movie that I actually remember). Local noise abatement policy is to fly the traffic pattern over water. As a result, we entered downwind south of the Round Island Lighthouse, visible from the Mackinac Island Harbor. We turned onto a base leg southeast of the Island. The automated weather observation station reported wind more-or-less down the runway at fifteen knots gusting into the mid-twenties. It was an improvement over the conditions we faced on our previous Mackinac landing, but I suspect that gusty winds are the norm for this airport given the topography. The runway was visible as a dark stripe down the center of a clearing in the middle of the island. It has been completely rebuilt since our previous visit, leveled such that the opposite ends of the runway are now visible from each other. As we crossed the shoreline, we noticed a lot of formerly-submerged rocks visible above the water. Lake levels were obviously lower than on our last visit. I did not have much time to sight see. As we lined up with the runway, Warrior 481 rocked and bucked in the gusts. We rode her down, making corrections as needed, and landed smoothly on the new runway. Nice. The Bear had landed on her second island! We arrived at 11:30 in the morning, perfectly poised to enjoy a nice lunch in town. I paid our daily parking fee ($10.50 for my single engine airplane) and signed-in. As I was writing, the signature above mine caught my eye: "Mac McClellan". Mac McClellan? The Mac McClellan? The long time editor of Flying magazine and current VP of Publications and columnist for Sport Aviation? Under "arriving from", he had written "MKG". I knew from reading his "Left Seat" column that Mac relocated to Muskegon, MI after leaving Flying. "Hey Kristy," I exclaimed. "Mac McClellan landed just before we did! How cool is that?" "Care to share our taxi into town?" came a soft-spoken voice behind me. I turned and there was no mistaking the speaker for anyone but Mac himself. I felt a flush of embarrassment over my exclamation, but Mac gave us a kindly smile and held the door for us. Mac's family was already waiting in the horse-drawn taxi. We joined them with me sitting next to Mac and The Bear on my lap. I have always enjoyed Mac's insights into the state of aviation and have even borrowed some of his excellent examples and arguments when trying to explain aviation issues to non-aviators. Mac is definitely an instrument guy, skewing toward the Richard Collins perspective on aviation (all IFR all the time) rather than my preference for looking out the window. For this reason, I have always identified more with writers like Lane Wallance whose perspective is more closely aligned with mine. But credit must be given where credit is due: it was Mac who hired Lane to write for Flying in the first place. Like all good leaders, Mac had the wisdom to recognize that he needed writers on staff with different styles and interests from his own (aside from a love of flying, of course). Perhaps it is of very little surprise that, after Mac and Lane left Flying for Sport Aviation, I allowed my Flying subscription to lapse and signed up for the EAA publication. And now I was sitting next to Mac in a horse-drawn taxi on Mackinac Island. It was a little surreal. What do you say to someone of Mac's stature in the aviation world? I had so many questions that I would have loved to ask him, but the man was on vacation with his family and it felt rude to pester him. We made small talk. From his writing, I already knew what Mac flew, where he was based, and even his wife's name. I confessed to flying a Warrior out of Rochester, NY. I told Mac about how his frequent mentions of Muskegon often make me reflect back on my disastrous interaction with air traffic control there as a solo student on a cross country. Mac smiled, noting that the Muskegon controllers are rather laid back compared to places out east. "I know," I replied in agreement. "That's how bad I was!" We chatted further about fun flying destinations, periodically interrupted by The Bear exclaiming "more horses!" whenever we encountered another carriage. We disembarked in the center of town and shook hands before our families parted company. When I told him that it was a pleasure to meet him, it was with the utmost sincerity. We oriented The Bear to her surroundings, showing her Fort Mackinac (above), the harbor, and main street. We found lunch at the Yankee Rebel and rented two bikes, one with a tag-along for The Bear to ride. Though there was some angst at the beginning, we were soon cruising the streets of Mackinac Island with The Bear frequently exclaiming "this is fun!". She especially liked it when we passed horses. We stopped near Arch Rock along the shoreline where we had noticed so many exposed rocks off shore. The Bear was in ecstasy with so many rocks to climb on, sort through, and examine. Yes, there was even some yoga involved, though I confess ignorance about what inspired it. After walking some distance off shore, I noticed some very black clouds to the north. I worried about becoming trapped on the island, so we made our way back to our bicycles and returned to town. This toy store has two branches: one on Mackinac Island and the other in my home town. After four hours on Mackinac Island, we departed for Michigan's lower peninsula. Per noise abatement requirements, we maintained runway heading until reaching 1900 feet. This brought us close to the Mackinac Bridge so we circled it to give The Bear a good look. As we turned southbound west of the bridge, another aircraft called on our frequency. "Mackinac Island Airport, Cessna XYZ, low pass, runway 26, Mackinac Island." The park ranger manning the Unicom that day called to remind the pilot that nose abatement procedures required his pattern be flown off-shore. "We'll stay off shore," responded the pilot. "Cessna XYZ, low pass, runway 26, Mackinac Island." Though the pilot was not necessarily violating the noise abatement rules, low passes can be a nuisance to people on the ground. Why anyone would fly a low pass over a noise sensitive airport was completely beyond me. Back over the lower peninsula, we left the dark clouds behind, but occasionally flew below cumulus shedding light rain. High tension wires passed through a clear-cut region of Michigan's rural, heavily wooded north. I could not help but wonder if this is what Eddie Grant had in mind when he sang about "Electric Avenue" (somehow, I doubt it). We stopped for fuel at Jack Barstow airport in Midland, MI. The brand new pump there was dispensing avgas at a remarkable $5.15/gal. We filled up completely before returning to the sky en route to Oakland County International Airport. 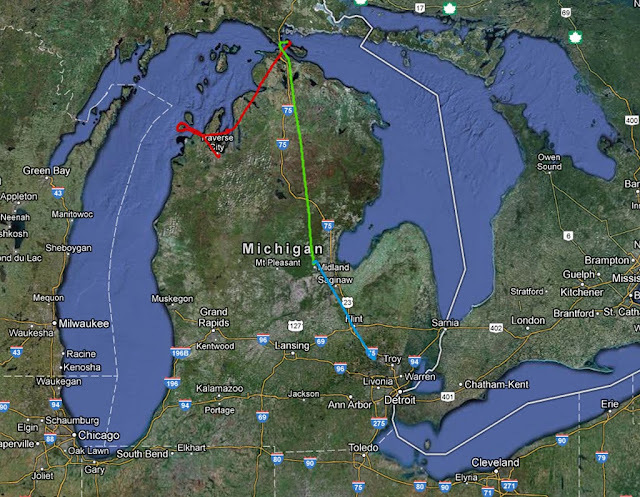 I think we woke the approach controller at Saginaw, there was absolutely nothing going on in his airspace. As a college student in the early 1990s, I lived in downtown Flint. I was a co-op student at AC Rochester (now Delphi) in the Ceramic Engineering and Research department for nearly four years. Our engineering building was physically connected to the Delco Electronics engineering facility and adjacent to the mammoth AC Spark Plug Plant along Dort Highway. Just north of downtown Flint, a significant portion of Flint real estate was occupied by "Buick City", a massive facility that was literally a city-within-a-city busily turning out LeSabres. One day, another co-op student and I used our AC credentials to enter Buick City and watch cars being built from the ground up (at the time, AC was a division of GM). We asked for directions to the painting booths at the Power House, a massive blue structure containing three nine-story tall coal-fired boilers that provided power to the entire site. To this day, I still remember seeing the walls of those massive boilers pulsing as they "breathed". The Power House foreman took us to the roof, once the highest point in Genesee County, and provided directions by referring to the real world map spread at our feet. But that was another time. Some years ago, both sites were decommisioned and erased from the Earth, leaving behind empty grey spaces. As we approached Flint from the north, a huge grey emptiness appeared where Buick City once stood. More difficult for me to see was the empty place that was once home to AC Rochester Flint East. Although all traces of the building I worked in for four years were gone, the trees that once adorned the exterior were still in place, indirect evidence of the structure's footprint. We flew just west of downtown, which looked substantially healthier from above than my former work site. I noted the campus of the University of Michigan - Flint and how it had grown since my graduation. We landed at Oakland County International ("Pontiac") around dinner time. As always, the folks at Pontiac Air Center took good care of us. After dinner, we drove to Cook's Farm Dairy near my home town. We used to go there often for ice cream when I was a kid. Not only does Cooks make their own ice cream on site, but they were very savvy about peanut allergies. Ice cream selections containing nuts were stored in a separate cooler from those not containing nuts. Once The Bear made her choice, their procedure was to open a fresh container of ice cream and serve it with a clean scoop to eliminate any cross contamination risk. Kudos to the staff at Cook's for managing the issue so rigorously without once looking at us like we were crazy. Once we were done with our dessert, we took The Bear out back to see the source of her ice cream: the cows! Her smile says, "yay! This is fun!" Her stance says, "don't you dare expect me to get any closer to that thing!" Close is evidently a relative term! I would have offered her some ice cream, but that just seems wrong. From an aerial tour of the Manitou Islands, to Mackinac Island, to hanging out with dairy cows, it was a full, fun day. The magnificent vistas we beheld at the north end of the mitten served as striking reminders of how beautiful a place Michigan really is. As we looked upon Lake Michigan -- at its size, power, sandy beaches, and shipwrecks -- we reinforced another truth: compared to Lake Michigan, the great lake in our back yard is kind of lame. What an awesome day of flying. From the beyond-description beauty of the shorelines to meeting Mac at Mackinac (did you note that at the time? ha!) it was quite the splendid day of aviating. In case you're wondering, I've been preventing myself from reading all your trip recaps until I get stuff up on my own blog. Call it delayed gratification due to prolonged procrastination.